"A tip: always start eating where it’s been filled. That little hole on the side." That way you'll avoid a mess, says Sandy Bakic. Stacks of raw pączki wait to go in the fryer. The dough is risen twice, which gives it an airy texture when fried. Though they were traditionally fried in lard, pączki are now mostly fried in vegetable oil. Pączki are a peculiar treat. The name is difficult to pronounce (poohnch-KEY), they’re difficult to make, and they’re difficult to find outside of the Midwest. The donut-like pastry (although never call a pączki a donut in front of a Midwesterner) originates from Eastern Europe, and came to Michigan thanks to the Polish population that began immigrating here in the 1880s. They settled largely in metro Detroit, forming the communities of Poletown and Hamtramck. Today, Michigan remains home to the third-largest Polish community in the country. A pączki infographic from a 1996 edition of the Detroit Free Press. New Martha Washington Bakery has been open since 1925, and the Petrovic family has owned it since the 1970s. 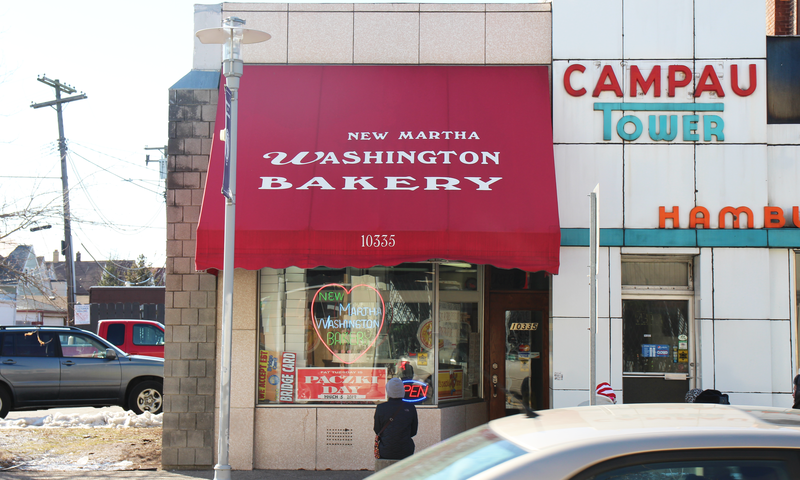 New Martha Washington Bakery opened on Joseph Campau Street in Hamtramck in 1925. Sandy’s parents, Petar and Ivanka Petrovic, have owned the bakery since 1973. But the traditional recipes are still the same. “This pączki recipe has been handed down through the generations, since this bakery was opened, so there is no way the recipe is gonna get out of here,” says Sandy. Her father, 83 year-old Petar, is still the only person who mixes the dough. Pączki are traditionally a pre-Lenten treat, created out of all the indulgences that were not allowed during the fast that the Orthodox and Roman Catholic churches practice in the 40 days leading up to Easter. When you look at the ingredients — yeast, egg yolks, cream, fat — it’s easy to see why pączki were traditionally only made once a year. Standing at the fryer, Sandy gently scoops floured balls of dough and places them in the oil with a satisfying sizzle. Once they're all in, she waits a moment before using long sticks to flip them over, occasionally poking at a few to make sure they don’t break and have oil pour in. Then she lowers a grate, submerging the pączki in the oil. Sandy Bakic flips a pączek in the fryer. After nearly 50 years of working at the bakery, Sandy isn’t tired of pączki yet. Pączki are filled with either custard or a jam. Traditional jam flavors include prune and rose, but fillings like raspberry and cherry are more common now. Although with 20 varieties this year, New Martha Washington has gone beyond the traditional. "On that day, everybody's Polish. For one day! St. Patrick's Day, everybody's Irish. Well Pączki Day, everybody's Polish. Even though we're Serbian!" To produce all of those varieties and keep them as fresh as possible, Sandy and the other bakers work overtime in the days leading up to Pączki Day. They prep over the weekend, and then work from 5 a.m. Monday until the bakery closes at 9 p.m. Tuesday. But despite the exhaustion, Sandy says it's a lot of fun. “On that day, everybody’s Polish. For one day! St. Patrick’s Day, everybody’s Irish. Well Pączki Day, everybody’s Polish. Even though we’re Serbian!” she says with a laugh. So track down your local baker and enjoy your pączki, Michiganders, because they’ll soon be gone for another year. Beat egg yolks with salt at high speed until thick and lemony. Scald whipping cream; cool to lukewarm. Dissolve 2 packets dry yeast in 1/4 cup warm water. Let stand for five minutes. Meanwhile, cream butter with granulated sugar until ﬂuffy. Beat the butter and sugar into the yeast mixture. Gradually add 2 cups flour, the cream and the brandy, beating constantly. Add 2 more cups flour. Finally, beat in the yolk mixture. Knead the dough well until air blisters appear. Cover with cloth and let stand in warm place until doubled in size, about 30 minutes. Punch down, and let rise again. Roll out on floured board, sprinkling top of dough with a little flour, about 1/2 inch thick. Cut into 3 inch rounds, place on floured board, cover with cloth, and let rise until doubled. Fry in 350 degree vegetable oil until browned on one side then flip. Cook until brown. Drain on absorbent paper, and let cool. Use a piping bag to fill with jam or custard of your choice. Dust with confectioners sugar or cover with glaze, preferably containing some grated orange rind. The day before Ash Wednesday has many names — Fat Tuesday. Mardi Gras. Shrove Tuesday. But all over the Midwest, it’s become known as Paczki Day. From Green Bay, Wis., to Lorain, Ohio, from Calumet City, Ind., to Hamtramck, Mich., people are snapping up the jelly donuts that have their roots in Polish cuisine. One Chicago bakery alone expects to sell 80,000 paczkis, so we’re going to go out on a limb and predict there may be millions sold in the Midwest on Tuesday. Changing Gears has been taking a look at immigrant traditions and culture across the Midwest, but the paczki seems to have transcended its beginnings and become a pre-Lenten staple. Hamtramck’s efforts to revive its signature public space are getting a big boost from the Ralph C. Wilson Foundation. The city will receive more than $800,000 to create a community-driven master plan for the 26-acre Veterans Memorial Park—the largest green space and public gathering spot in the tiny, densely-populated Detroit enclave. Stateside’s conversation with Mark Harvey, state archivist at the Michigan History Center, and Gary Gilette, author, founder, and president of Friends of Historic Hamtramck Stadium. For Michigan baseball fanatics, a visit to the corner of Michigan and Trumbull - the site of the original Tiger Stadium - is almost a religious pilgrimage. But there is another baseball field roughly five miles away in Hamtramck that has its own historical significance, and yet is rarely recognized. Mark Harvey, state archivist with the Michigan History Center, and Gary Gillette, an author, founder and president of the non-profit Friends of Historic Hamtramck Stadium, joined Stateside to discuss the stadium’s historical importance, its afterlife as a community sports center, and why rehabilitation efforts are so important.